Thank you considering Natural Dentistry’s Award Winning Dr. Yuriy May – Connecticut’s Top Dental Implant Specialist and Premier Holistic Dentist! We are honored to have you consider becoming our patient and experience the incredible health, wellness and dental services at Northeast’s premier Biological Dentist & Zirconia Reconstruction Dental Practice offering alternatives to root canals. We welcome every patient to call and inquire about whether their insurance will cover the following services: zirconia implants, second (or third) opinions, safe amalgam removal, root canal alternatives, cosmetic reconstruction, life-like-veneers, biocompatible crowns, ozone therapy, TMJ disorders, ALF appliances, and most importantly whether their dental insurance carrier is in or out of network. Please fill out the New Patient Request Form to receive a call from the New Patient Concierge to answer all your questions! Does Dr. May accept insurance? What is the dental office insurance policy? It is very important that new patients considering seeing Dr. May, Connecticut’s Top Holistic Cosmetic Dentist, understand that Natural Dentistry is NOT an insurance driven dental practice, in terms of diagnosis, recommended treatment and fees. Dr. May will diagnose, recommend treatment options and deliver therapy based on optimal health and biological indicators, not based on insurance coverage (what is covered vs not covered). At Natural Dentistry we believe it is essential for every patient to understand the importance of choosing a dentist wisely agnostic of insurance coverage, as not all dentists are created equal. There is a monumental difference in dental therapy approaches (both materials and surgical techniques) that patients expect to receive at Natural Dentistry that is different from most other dentists. While Natural Dentistry will do the best to offer patients options within their budget, some services are required for clinical standards, and cannot be opted-out of, such as removing or eliminating decay. Patients who will not pursue health related treatment due to insurance coverage are not considered an ideal fit for the practice could be dismissed from the practice, due to not accepting medical treatment. If you are a patient only looking for insurance covered services and are more focused on savings than investing into full body health and your maxillofacial diagnosis, then Natural Dentistry might not be the optimal fit for you as a patient. However, should you be considering investing into your long-term health, our practice is the perfect match as Dr. May’s dental services are ultimate self-investment into looking and feeling our best, as health starts with the mouth, even beauty shines from a gorgeous smile. Dr. May offers the most beautiful dentistry and health conscientious services in Connecticut, and participates with all insurances as an out of network provider to make our one of a kind dental and health services available to all. 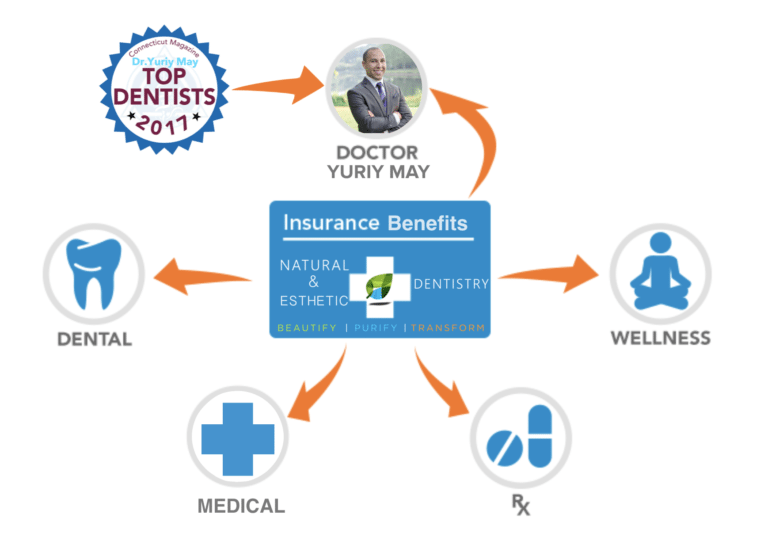 Because of the diversity of insurances that patients have and the wait list that Dr. May has accumulated over the last year, Natural Dentistry has been forced to reduce its in-network participation, but fortunately still participates with all dental and medical insurances as an out-of-network provider. In addition, Natural Dentistry accepts all HSA/FSA (flexible or health savings account cards) and offer incredible financing options that empower patients with amazing borrowing options that allow them to rebuild their entire mouth and become disease and infection free in an entirely biological and metal free way, while paying off the procedures under subsidized fixed interest rates over 6+ years (or 0% APR no interest plans short term plans). Between out of network coverage, which helps cover the cost of services, and third party financing, over 90% of our patients can afford their full treatment plans and have the opportunity to regain their health, wellness and change their life. Regaining an individual’s health by seeing a top dental practitioner like Dr. May is a step that one has to be prepared for, since the decision represents not just a clinical one or an insurance preference, but a truly life altering one! Numerous of Dr. May’s patients state that getting their health back was worth every penny and the decision has been turnkey in changing the course of their happiness and life trajectory. Changing lives and healing are the driving forces behind Natural Dentistry’s treatment planning philosophy. Who are Dr. May’s typical patients and where do they come from? Patients come internationally from Europe, Asia and South America and nationally from all the states. These are zirconia implant, surgery and full mouth rehabilitation cases. Biological and Holistic patients from all over the Northeast from Florida to Maine are considered “local” patients! Connecticut based patients are considered “back yard” as so many patients travel to see Dr. May from all over the world and USA. Natural Dentistry is honored to call a limited number of celebrities, both local and national, Fortune 500 executives and government officials as patients and prides itself on patient confidentiality. For high-profile individuals, we close the office to other patients and limit staff on days of procedures to protect the anonymity and ensure confidentiality of celebrity patients. Dr. May has a following of patients from affluent areas of Connecticut, New York City, Westchester, Fairfield, Greenwich, Long Island, New Jersey and other locales where patients are seeing high end biological dentistry and cosmetic dental services and for ensured confidentiality. Dr. May is sought after patients all over the U.S.A., and has patients fly across the country to see him for full arch implant reconstruction work, dental implants, amalgam removal, ozone therapy, root canal alternatives and smile design work including California, Washington, Colorado, Arizona, Minnesota, Illinois, Florida, Louisiana, Tennessee, North Dakota, New Hampshire, Maine, Virginia, Georgia, Montana, Kentucky just to name a few recent patient locations and of course, thousands of patients from the tri-state: New York, New Jersey, Rhode Island and Massachusetts. Because of the diversity of insurances that patients have and the wait list that Dr. May has accumulated over the last year, Natural Dentistry has been forced to reduce its in-network participation, however, participates with all dental and medical insurances as an out-of-network providers. This helps cover the cost of services, instead of not accepting any insurance at all. How do I know whether you accept my dental insurance? Natural Dentistry is not an insurance driven practice, and accepts limited dental insurance plans as an in-network biological dentist provider. As a courtesy to our beloved patients, we participate with ALL insurance companies, as an out-of-network provider. Chances are, we are NOT in network with your insurance carrier, instead we offer unprecedented medical and dental care to our patients that is very difficult to find elsewhere. Our out of network insurance participation helps cover the cost of services and health savings accounts and flexible savings accounts along with patient financings greatly helps our patients afford our premium dental services. If you are only interested in receiving in-network and insurance covered services, please know we may not be able to accommodate you. However, as an out-of-network dentist, we will bill all services on your behalf to your carrier. Your carrier may reimburse you directly, and all estimates for dental work should be done by the patient with the help of Natural Dentistry’s administrative staff. Patients are wholly responsible for the balance of the bill that insurance does not cover. Should you choose to make a new patient appointment, please note your first new patient appointment may be partially out of pocket and will include diagnostics! Upon receiving your New Patient Form Natural Dentistry’s new patient coordinator will call the patient to set up an appointment, discuss new patient fees including but not limited to required 3D CBCT/advanced diagnostic fees, exam fees and send you an email with all required medical and financial forms for you to become a new patient and book your appointment. Read more information about your new patient appointment here. It is the responsibility of all new patients who are with an out-of-network dental insurance to call their dental carrier/dental insurance provider and inquire whether they have out of network benefits that would allow Natural Dentistry to send claims to as an out-of-network dental provider based on your specific plan. If your carrier is out-of-network with Natural Dentistry, you may be reimbursed directly by your carrier. Why are some premium dental services at Natural Dentistry not covered by insurance? Part of our philosophy places our dental patients’ health above all else – which leads us to use the most premium, hard to source dental materials and equipment available on the market for biological, non-toxic, metal free and natural results. Our practice puts in an extraordinarily high degree of effort required into all patients, spending 3.0x more time with each patient than a typical dentist or dental surgeon properly diagnose, research alternative modalities of treatment for treatment planning and ultimately execute the perfect dentistry required to ensure the patients health is optimized and the dental results are worthy of admiration by patients and strangers alike. Due to our philosophy to put health and dental material quality above all else, our practice is not dental insurance reimbursement focused, however, to accommodate patients we do accept some (limited) insurance plans. Because we are a holistic and premium dental implant and reconstruction practice, there are some services that insurance will not reimburse for as they consider them unnecessary or “experimental”. Our office thinks of them as “cutting edge, research based alternatives” being offered by less than 3% of the world’s top dentists, which Dr. Yuriy May falls into. Dr. Yuriy May’s priority is to deliver optimal health, wellness and beautiful dental reconstruction, irrespective of standard dental insurance coverage policies. How will I know the cost of treatment? Each patient will receive full pricing estimates of treatment plans and the first new patient appointment. The estimates cannot be provided over the phone, and estimates are exactly as they are stated: estimates only. Natural Dentistry cannot control whether all dental services or a portion of dental services that patients’ dental insurance will cover or will not cover, nor can the practice control additional services that Dr. May may need to deliver during treatment based on radiographic information or observed infections during therapies or surgery. All patients are responsible for 100% of the fees for services rendered by Dr. May that insurance does not cover. The best part is we offer patient financing that allows patients to borrowing as much as $50,000 over 6+ years which has allowed many of our patients to change their ENTIRE lives, not just afford some dental work. When patients truly believe in the power of health and find the right clinician, like Dr. May, the top biological dentist in the country, anything and everything becomes possible. What is the financial policy for scheduling appointments for treatment with Dr. May? Once every new patient is presented with a treatment plan and recommended treatment options, patients are required to leave a 50% deposit based the estimated cost of treatment to book their next appointment. Can I use my Health Savings Account or Flexible Savings Account to pay for dental services? Natural Dentistry is a dental practice that is eligible for HSA and FSA spending accounts, and also encourages all patients to maximize their HSA and FSA accounts for tax saving benefits on healthcare in general. All eligibility and tax questions should be directed to a CPA for official determination of appropriate use of HSA and FSA funds. What if I can’t afford to see Dr. May CT’s Top Holistic Dentist & Dental Implant Specialist? Discounts can be accommodated based on financial hardship, severity of the health of the patient and other circumstances that need to be discussed with our highly trained and incredibly compassionate office manager. Our goal and mission is to deliver premium dental care to everyone – as we believe everyone deserves the best health from honest, knowledgeable and talented physicians like Dr. May. In order to help financially challenged patients achieve health, aesthetic and restorative goals, Natural Dentistry is happy to discuss financing options and help patients budget to afford treatment. Additionally, we encourage use of Health Care Savings (“HSA”) and Flexible Savings Accounts (“FSA”) to help save on taxes and make treatment more affordable.